In case it escaped your notice, this summer has been hot. Exceptionally, meltingly hot. And while the heat has wreaked havoc on air conditioning bills and left me breathless and cranky more than a few nights this summer, it has had at least one pleasant side effect. This summer, the sugar content in all kinds of fruit is higher than usual. Those peaches from the farmer's market? They really are sweeter than usual this year. The apples that are coming in season? Lots and lots of natural sugar. And while a just-picked piece of fruit from a beautiful tree is a perfect snack, adding just a few ingredients can turn it into a company-worthy dessert. pages/news/2011/qtr3/cpc3/farmersMarket.html). But if you're in a hurry, or if pie crust is a challenge you're not ready or willing to tackle, a cobbler will hit the spot in a fraction of the time. 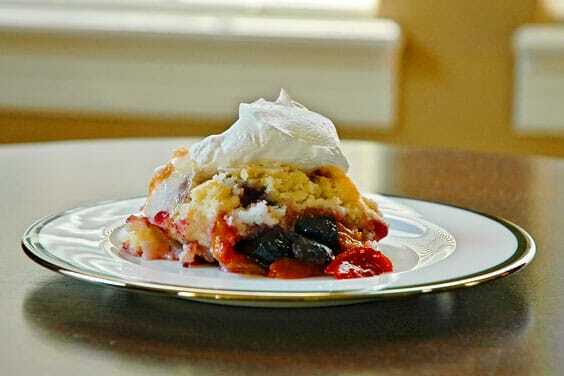 There are nearly as many kinds of cobblers as there are cooks, but cobbler consists of some sort of sweetened fruit with a biscuit or cake-type topping. Closely related to a cobbler is something my grandmother, who grew up on a farm and was an expert in handling fresh produce, called a "Betty," or a crisp. Crisps and Bettys are usually thinner and sweeter than a cobbler topping, more like a streusel. My favorite apple crisps also include some rolled oats, which lend a nice chewy texture. The recipe for cobbler I've included here came out of my great-grandmother's recipe box. The ingredients are all very ordinary, and you'll likely have all of them in your refrigerator and pantry right now. The only unique feature of this recipe is the use of boiling water, added on top of the cobbler just before putting it in the oven. This dissolves the sugar and gives the cobbler a crispy crunch when you bite in. You can eat cobbler unadorned, but it is simply divine with a dollop of whipped cream or a generous scoop of vanilla ice cream. And, because cobbler includes fruit, you can easily justify eating the leftovers for breakfast. Four to five cups of any chopped fruit, (peeled apples, pears or peaches; cherries, berries, rhubarb) Fruit can be fresh, frozen or canned. If using canned, drain well. Generously spray a 9x13 baking dish with cooking spray, then cover the bottom of the pan with fruit. 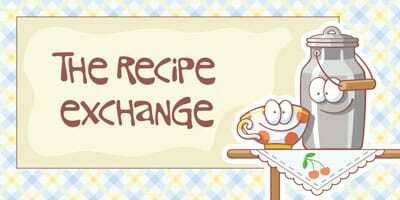 Cream 1 ½ cups of sugar with the butter, then add the milk, baking powder, salt and flour. Spread the batter over the fruit. Pour the boiling water over the entire cobbler, then carefully place the pan in the oven and bake for 50 to 60 minutes, until the top is browned and the dessert is set in the middle. Serve warm or at room temperature. Cook's Tip: To peel peaches, heat a pan of boiling water. When water is boiling, gently submerge the peach with a large spoon and boil for about 20 seconds, then remove. Cool slightly, then cut an "x" in the bottom of the fruit. Use your fingertips to gently slip the skin away from the fruit. The fruit will be warm and slippery, so use care not to drop it! Editor's Note: Special thanks to Lisa for preparing this delicious dessert and sharing it with us at our staff meeting - it really was fantastic!